Before moving on to resignation or other drastic measures, use this complaint letter to combat a hostile work environment. As my employer of 14 years, you must understand how much it pains me to write you this letter today. However, I feel that I can remain silent no longer. Our workplace in the shipping department of Anytown Department Store has become extremely hostile, and I must ask that measures be taken to remedy this situation. The problem first became apparent to me three months ago, which was when the first major incident occurred. The new shipping manager, Mr. Brown, called me into his office to tell me that I had sent a package to the wrong address. I politely apologized, but he continued to yell at me for over half an hour until I was crying. I was embarrassed in front of the entire shipping staff. Hostile events continued over the next few weeks, with Mr. Brown yelling at employees, throwing papers, and threatening to fire us on a regular basis. He is particularly cruel to me, often calling me names and standing over my shoulder. This makes all the employees uncomfortable, and I believe both productivity and morale are down. 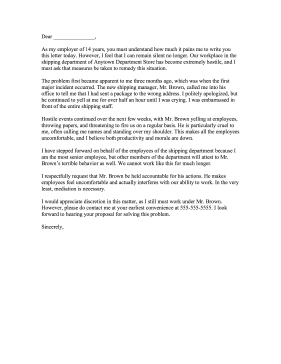 I have stepped forward on behalf of the employees of the shipping department because I am the most senior employee, but other members of the department will attest to Mr. Brown's terrible behavior as well. We cannot work like this for much longer. I respectfully request that Mr. Brown be held accountable for his actions. He makes employees feel uncomfortable and actually interferes with our ability to work. In the very least, mediation is necessary. I would appreciate discretion in this matter, as I still must work under Mr. Brown. However, please do contact me at your earliest convenience at 555-555-5555. I look forward to hearing your proposal for solving this problem.